Russian manned spacecraft. Study 2008. This conical, six-crew space capsule represented the Russian Space Agency's preferred design to support Russian spaceflight in the 2018-2068 period. AKA: Pilotiruemiy korabl. Status: Study 2008. Payload: 3,300 kg (7,200 lb). Gross mass: 11,000 kg (24,000 lb). Height: 7.70 m (25.20 ft). Diameter: 3.80 m (12.40 ft). 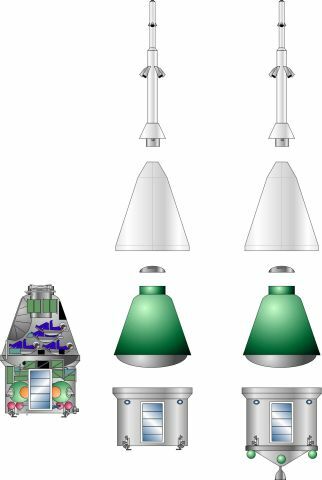 By mid-2008 the Russian Space Agency, after evaluating Energia's various Kliper proposals, and Khrunichev's TKS derivatives, was supporting development of a conical spacecraft, its aspect ratio similar to the Gemini spacecraft, with an unusually deep hemispherical heat shield. Used with the Angara 5P booster launched from Vostochniy, the design would exceed the Agency's requirements for its new-generation piloted spacecraft in several areas. It would not subject the crew to more than 3 G's during normal ascents to orbit and re-entries, or more than 12 G's in an emergency abort during the launch phase. The spacecraft would be placed in a 135 km x 440 km, 51.6 deg orbit on the baseline mission to the ISS. Its on-board propulsion system would bring it to a rendezvous and docking with the station. On such missions the spacecraft could bring up to 3300 kg of payload, in addition to the crew of six, to the station. 500 kg of payload could be returned to earth. The capsule provided a total of 28 cubic meters of pressurized volume, 18 of it usable, 12 of it habitable, or 2 cubic meters per crew member. The capsule provided sufficient lift for a cross-range of 180 km to either side of the ballistic re-entry landing point, and 600 km along the orbital track. This meant it could return the crew to Russian territory on 7 to 8 orbits per day, or nearly half the time. Landing precision was within 2 kilometers of the aim point, and 75% of the capsule could be reused after a mission. PK-NO, the baseline design for ISS missions described above, would have a total mass of 14,300 kg including the 3,300 kg payload, and be launched by an Angara 5P booster. PK-L would be used for lunar missions. It would require the Angara 7P booster and have a total mass of 27.2 metric tons, the difference including a more powerful rocket engine and propellants for entry and return from lunar orbit. It could a crew of four and 500 kg of payload to lunar orbit and back. PK-M was designed for crew return from Mars missions. With a total launch mass of 15.8 metric tons, it be launched with an Angara 5P and would have to dock with a Mars expedition already assembled in earth orbit. GK-3 was an unmanned version, launched by the Angara A3, designed to deliver 4500 kg of payload to the ISS and return 500 kg to earth. It would have a launch mass of 14,600 kg. GK-3L was the same as the GK-3, but stripped of recovery systems and heat shield. It could deliver 7000 kg of payload to the ISS on a single Angara A3 launch. GK-5H replaced the PK capsule entirely with a cylindrical payload carrier with 60 cubic meters of pressurized volume. It could deliver 14.6 metric tons of cargo to the ISS on a single Angara 5 launch. MMK-3 would use the PK service module to deliver a multifunctional modular spacecraft, a space station module similar to the Kvant-1/37K series developed by Energia in the 1970's, to the ISS. The 14.7 metric ton spacecraft, launched by an Angara A3, could deliver 8.8 metric tons of payload within a 50 cubic meter cabin. MMK-5 was as the MMK-3, but stretched and launched by the Angara A5. The 25.4 metric ton spacecraft would include 17.5 metric tons of payload in a 70 cubic meter cabin. Provisions for crew rescue from the moment of launch to recovery. This meant an abort tower for the early launch phase, and a reserve parachute for recovery, but not ejection seats or orbital bail-out pods. Normal launch and recovery from the territory of Russia (this would require launch from the new Vostochniy Cosmodrome instead of Baikonur). Crew Size: 6. Orbital Storage: 365 days. Habitable Volume: 12.00 m3. Family: Manned spacecraft, New Generation Crewed. Country: Russia. Agency: Chelomei bureau, RAKA.